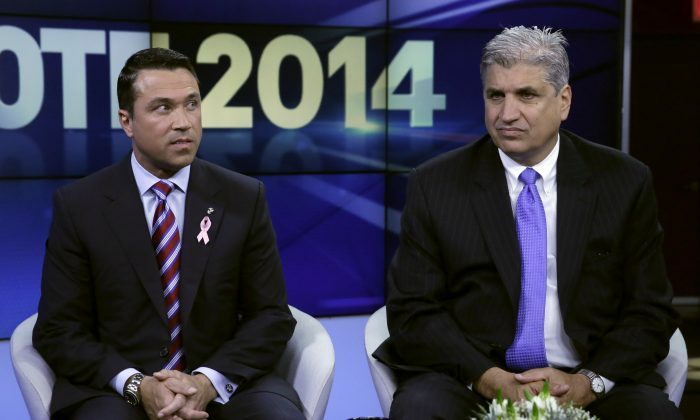 NEW YORK—Congressman Michael Grimm and challenger Dominic Recchia traded well-worn jabs with each other Tuesday night in the final debate before the election. Grimm took repeated snipes at the fiscally progressive voting record of Recchia, a Democrat. While Recchia was the finance chairman of the city council, he voted for congestion pricing that would raise bridge tolls. “If everyone believes that my opponent saved the city by raising property taxes, God bless you, but the reality is the fact that they gave out rebates means they didn’t have to raise it that high,” Grimm said. Recchia used Grimm’s reference to finances to once again bring up Grimm’s federal indictments, as he has done religiously in previous debates and throughout this campaign. “My opponent is the last one who should be talking about financial advice, your campaign is in debt, you are indicted because you do not know how to run a business,” Recchia shot back. Recchia has focused on leveraging Grimm’s 20-count federal indictment—he allegedly underpaid workers and shirked paying taxes at his Manhattan health restaurant—into an electoral victory in the conservative 11th congressional district and has used it repeatedly as a shield in debates. Still, the debate—a leisurely hour-long affair hosted by the Staten Island Advance—let the candidates show a more personal side to themselves and explore their commonalities. In the lightening round of the debate, both candidates struggled when they were asked to name the last book they read. “It’s been a while, I haven’t had time to read, I think it was Tom Clancy,” Grimm said, after which Recchia shrugged off the question. The political foes also shared vacation habits—both had last taken their last holiday in Florida. But they also had their differences. Recchia admitted that he had tried marijuana, whereas Grimm said he had not, much to the chagrin of the audience. The Tuesday debate was imbued with the usual acrimony that had distinguished this congressional race, but was marked by relative civility in contrast to the previous televised debate on WABC. The debate also saw Grimm regaining some confidence and going on the offensive. When Louis asked Grimm about an incident in January where the Congressman threatened to physically assault a reporter, Grimm spun the question to his advantage.